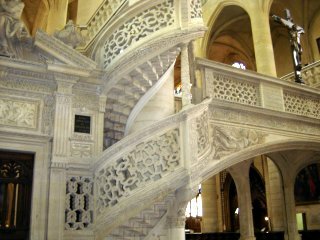 The church of Saint Etienne du Mont, located on the Place Sainte Geneviève, just opposite the Panthéon, is one of the jewels of Paris Churches. It is also one of the more unusual churches in the city. This particular spot has a rich and long history that reaches back to the very early days of Paris. In 508 A.D., Clovis I, at the request of his wife and of Geneviève (who was later to be canonized "Saint") began a church in honor of Saints Peter and Paul. Clovis died in 511. Geneviève died the following year. Her relics were enshrined in the church and it soon came to be known by her name. 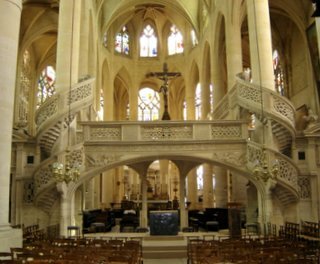 The church of Sainte Geneviève became the center of a great monastic abbey and the surrounding area swelled with laborers and craftsman who worked in and around the compound. The Abbey and the cult of Sainte Geneviève grew in popularity until the area became a main pilgrimage center. To accommodate the growing crowds, and to keep them out of the Abbey proper, a new parish church was begun along the north wall of the Abbey. It was at that time that the Archbishop de Sully decided that the Ile de la Cité was the appropriate place for the royalty to have their services. It was no longer to be Saint Etienne du Mont but the Notre Dame de Paris. Saint Etienne's relics were given to the Abbey, giving Saint Etienne du Mont its name. By 1328, the surrounding parish had outgrown its church and a rebuilding project began in which the original structure was enlarged. In 1491, the Abbey donated land on the adjoining wall for the rebuilding of the church and the present building was begun. With many a start and stop, it took nearly 130 years for the present church to reach completion. 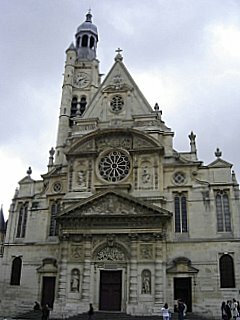 The successive stages of construction are evident in the mixture of Renaissance and Gothic architectural styles in this most unusual of Paris Churches. The vaults of the apse were built in 1491, the chancel in 1537, the gallery in 1545 and the vaults of the nave and the transept were finished in 1580. The portal was built in 1610 and the bell tower in 1624. Looking at the church of Saint Etienne du Mont from the Panthéon, one needs to remember that St. Etienne's stood very near the Abbey church of Ste. Geneviève for over two hundred years and its look was balanced by that of the larger, more imposing church. The interior of the church is 223 feet long. The nave contains five bays containing dedicated chapels.The chancel is surrounded by an ambulatory. The pillars dividing the nave from the aisles are encircled halfway up by a stone railing. The one from the chancel connects to a Rood Screen. One of the most unusual features of Saint Etienne du Mont and probably its most beautiful element is the Rood Screen. The Rood Screen is a double-stair arch that separates the choir, where the monks or canons sat, from the body of the church where the parishioners sat. A reader would mount the screen by way of the intricately carved stone steps to do the readings for the day. This Rood Screen is the only one left in Paris. It is a tremendous work of craftsmanship which adds a commanding elegance to the interior. Another great treasure of the church is the wooden pulpit which dates from 1651. It is beautifully carved and has at it's base, holding the pulpit upon his shoulders, a sculpture of Sampson. 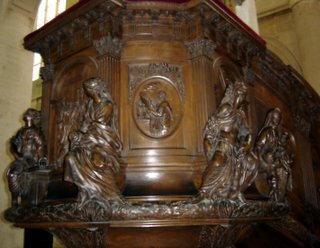 Ringing the pulpit are carvings of seven women who symbolize the virtues: Prudence, holding a book; Justice, a sword; Faith, a cross; Hope, an anchor; Temperance, pouring wine from a jug; Fortitude, holding a club and Charity, surrounded by children. 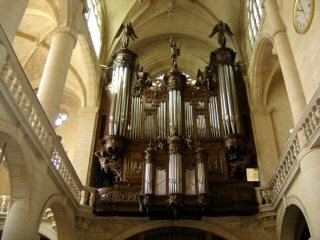 The organ of Saint Etienne du Mont also deserves attention. It dates from 1633 and the casing was built by Jean Buron. It is a masterpiece of carving and an architectural element in its own right. The organ itself was built by the master organ builder Pierre le Pescheur, completed in 1636. After a fire in 1760, it was rebuilt in 1777. The organ was last altered and upgraded in 1956 with the addition of the pedal division which is just outside the organ loft and the echo division which is in the stair tower leading to the organ gallery. The organ has a full ninety stops and four keyboards. Concerts are held in Saint Etienne du Mont quite often and the organ gets lots of play. If your timing is good perhaps someone will be playing it when you visit.